Since 1963 the brand TENSID-CHEMIE stands for an innovative company whose sustained success story is equally based on advanced, premium quality products, responsible concepts, eco-conscious technologies and practical product developments. When it comes to the maintenance of their high quality standards, our customers from the food and beverage industry as well as from foodservice rely on our know-how and our experience as a manufacturer of cleaning and sanitizing detergents. This trust is a guiding principle for our daily actions. Its premises are individual consultancy, comprehensive hygiene system solutions based on the individual customer requirements, high flexibility and a steady product enhancement. We think ahead and find solutions for the challenges of tomorrow. We are a system provider for all questions related to hygiene and as such we focus on customer service. Individual consultation, state-of-the-art application technology, process optimization as well as sophisticated dosing and control technology are our goals. Of course, our product range is not limited to cleaning and sanitizing products. We also offer tried and tested products for a broad variety of other applications- from conveyor belt lubricants to water treatment products. On request, we are pleased to fill you in on the details. For us – the TENSID-CHEMIE – hygiene means much more than just mere cleanliness. Hygiene is also always a synonym for trust and trust is our most valuable capital. For more than 50 years now, we have been setting the standards for first-class products and customer service when it comes to professional cleaning and sanitizing. 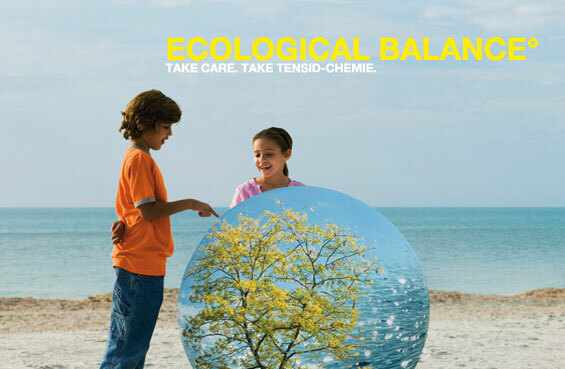 Our good name vouches for quality, reliability, ecological sustainability and economical profitability. No matter what industry they are in, to ensure a consistently high level of hygiene is not only a legislative necessity for our customers, but also a means to guarantee a premium product quality. Comprehensive on-site consulting and customer service is therefore a top priority for our field service. We focus on individual concepts and solutions devised in close cooperation with our customers. Each customer has its individual prerequisites and we strongly believe that our way is the only one to make sure these prerequisites are optimally taken into consideration. Furthermore, the users of our products play a significant role in the whole research & development process. Through our personal customer contact we gain the insight we need into the actual operational requirements on modern cleaning and sanitizing detergents to be able to guarantee the user-friendly products and solutions we stand for. Without skilled and motivated employees – not only in R & D – we would not be able to keep up with our high quality standards. It is therefore a fundamental concern of ours to qualify our staff ourselves and to continuously provide further vocational training programs and in-house courses on the latest developments in our area of expertise – cleaning & sanitizing. Of course, all employees participate in these programs and courses – independent of the position they have in our company. The many years of service and loyalty our employees show and the excellent reputation we have with our customers prove us right. We are dedicated to producing premium quality, state-of-the-art cleaning and sanitizing detergents. Our whole production process in Muggensturm and Quito is therefore based on a quality management system that complies with the internationally recognized standards DIN ISO 9001:2015 and DIN ISO 14001:2015. To make sure these high standards are constantly met with and we still merit the certificates, our work flows and quality management criteria are regularly subject to both internal and external audits. At all our locations, we have provided the best possible production conditions for our superior products – including a proactive maintenance of our production facilities to avoid technical breakdowns and a batch-related production in close coordination with our laboratory and logistics teams to guarantee the retraceability of our products. All staff members are jointly responsible for our quality guidelines. They also play an important part in the definition of our workflow and our production processes to ensure the customer requirements are constantly met with – now and in the future. Of course, all our employees are subject to systematic staff training and development programs. The quality management guidelines are determined, reviewed and re-adjusted by the company management to make sure our high quality standards are continuously met. As an international company, it is our claim to be available as a direct contact for our customers, wherever they might be. For this reason, our first subsidiary, "TENSID-CHEMIE Vertriebsges. m. b. H" was founded in Austria in 1989. This was followed by "TENSID-CHEMIE Hungária Kft" in Hungary and "TENSID-CHEMIE Zagreb d.o.o." in Croatia. Since February 2005, TENSID-CHEMIE has a joint venture in Ecuador. The aim is to deliver our products not only to the Ecuadorian market, but also to the connecting countries like Colombia, Peru and Bolivia. We have also established a network of partnership alliances in many other countries such as Russia, Czech Republic, Slowakia, Macedonia, etc. TENSID-CHEMIE Vertriebsges. m. b. H.
OOO "DÖHLER NF & BI"
As a manufacturer of chemical products we are, of course, well aware of our responsibility for the environment. This responsibility does not only include the production process itself, but also the research for and use of ecologically – compatible raw materials that help saving resources. Ecological sustainability is an important guideline for daily business. Our goal is to resolve the perceived dichotomy between technical progress and environmental protection. So, for TENSID-CHEMIE Research & Devolpement does not end where the production process starts. On the contrary, based on the principle of an integral ecological responsibility, R & D does also comprise all questions of product application, reusability and disposal. An environmentally compatible behavior and the care for a corresponding production process is required from all our employees. To make sure these demands are complied with, our staff receives regular training. Each member of the TENSID-CHEMIE team is well-aware that future generations are affected if we do not take care of an environmentally compatible behavior today and subjects his daily work to this guiding principle.